So after all the stress and business of wedding planning all summer long, I decided it would be nice to wind down my summer with a convention! The kids and I took off Wednesday morning, an hour later than I had hoped, but still in good time. I needed to stop in Kearney and decided I might as well just travel the last 80 or so miles with Mom & Dad and the kids. Since we are just going to make it in time for the evening meeting, we stop at the Wendy's drive thru and head down the road with our jr. bacon cheeseburgers. heard it! I've never had a tire blow while I was driving, so I always wondered (and worried) what it would be like. 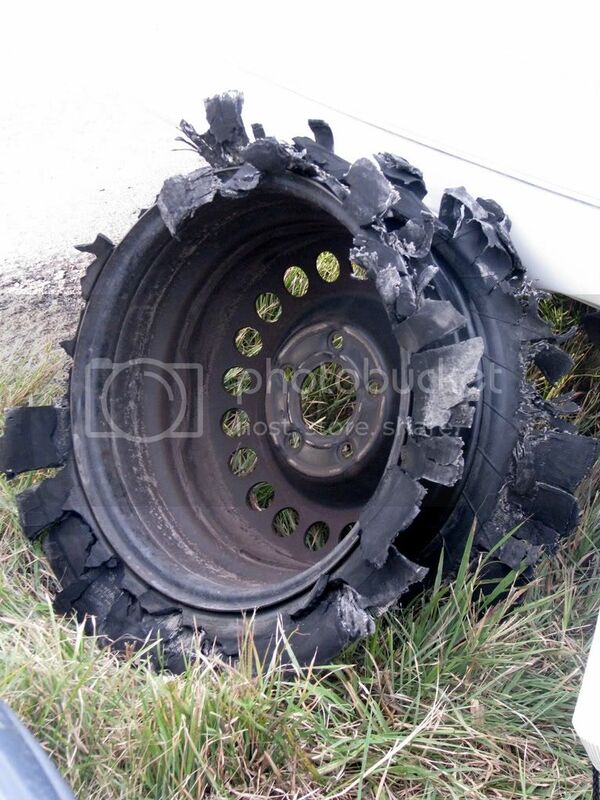 You hear horror stories about people loosing control because of a tire blowing and that was one of my fears. Thankfully, it was nothing of the sort! 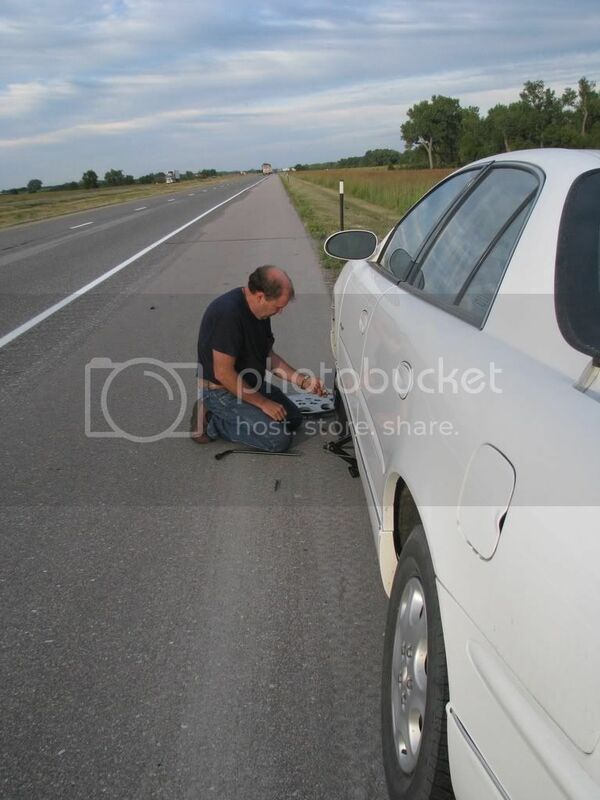 I got pulled over pretty quick and Dad turned around (yes, illegally) to come back and help me. 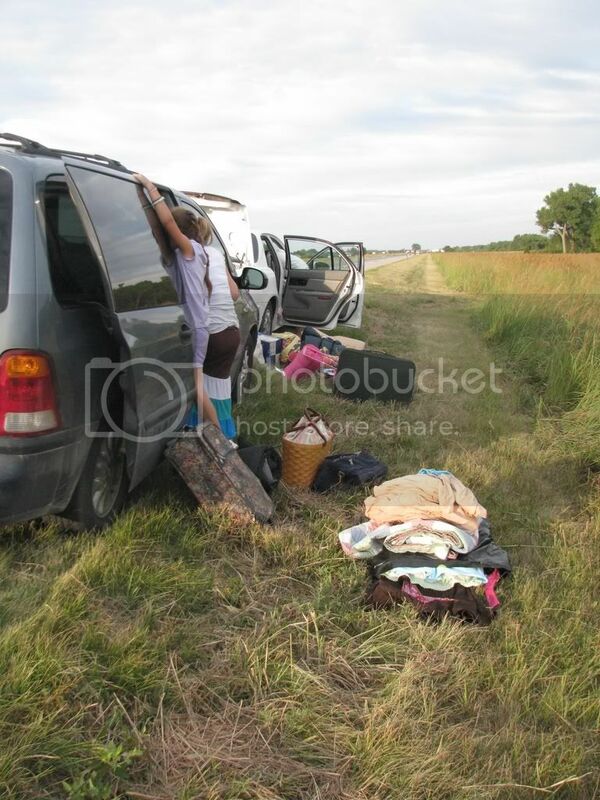 It's not much fun to have to unload the trunk of your car that you (ok, your husband) so carefully loaded, on the side of the interstate! I also learned there's not much to entertain a restless 18 month old boy on the side of the interstate either! I called Ryan (my brother) and asked him to switch me cars so he could take mine to have new front tires put on it, and then bring it to convention on Friday. So that all worked out great. Really hadn't planned on getting new tires of the car this soon, but oh well. Now here I am today. (Monday) I stayed in Kearney Sunday night because I wasn't up to driving 300 miles home at 5 in the evening with 2 convention weary children. I slept in this morning and took my time, had lunch with Mom & Dad and then headed home. 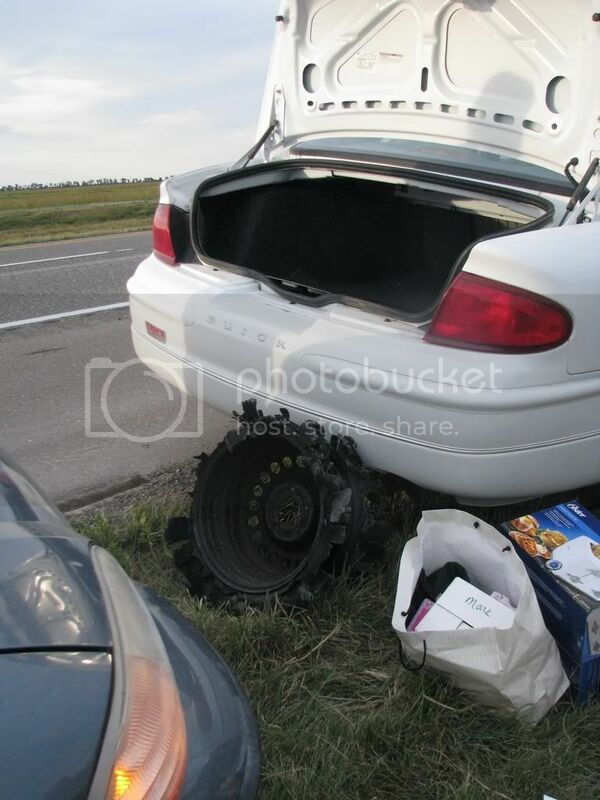 Imagine my irritation when just a smidgen past the Ogallala exit, I realize I blew ANOTHER tire! Now really, in the average life span, how many tires does the average person loose?! I think I've exceeded my average. Off I drove, on the donut, and found a tire store on the way out of town. 2 more tires coming right up! Thankfully, I made it the last 70 miles home incident free! It was a wonderful convention, by the way! Nish I would say you've exceded your limit on tire blow outs. Glad you are all safe and sound back home again. Glad you are safe! We managed to lose two tires in Indianapolis one time by hitting a pot hole--while Wayne was dodging a chunk of concrete a semi had thrown! Not cheap trips are they!? Home Sweet Home! Wow, that's crazy. Glad nothing bad happend though! Well, these tires were Michelins (top of the line brand) and they still had 1/2 the tread left on them. They were making some noise, but it didn't seem that bad. Sounded like tread wear just from needing an alignment which I had done. Turns out the tires were just plain rotten. And now its so quiet that if I'd known how much noise they really were making (they were that way when I bought the car), I would have changed them before it ever went on the highway. Oh my...that's about all I can say. I would have done the same thing that you did...except probably would have gotten a ticket or something backing down the interstate! Haha! We did have a good convention though didn't we! Have a goodyear...I mean good year! wow, eventful life? lol glad you made it home safe! yeah it was a great convention! Oh... what a bummer. Glad everything turned out as best it could. Have you gotten some rest since getting home? Hope so.